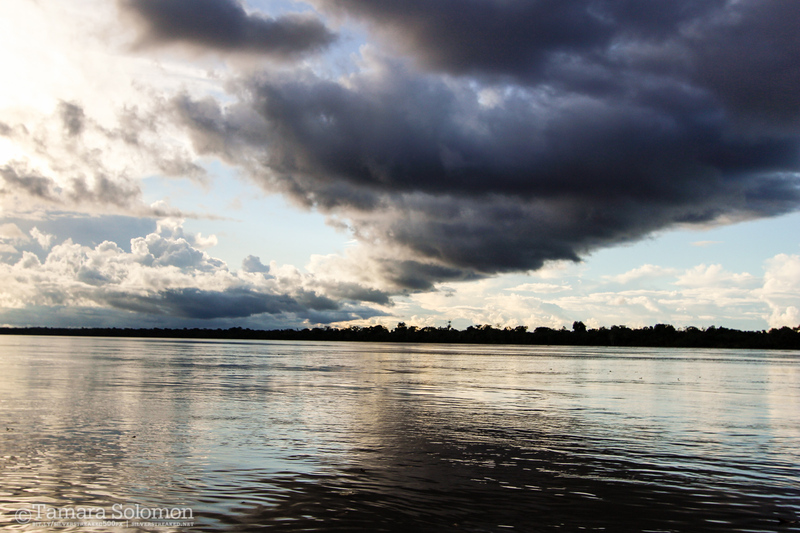 Hello all – as mentioned at the end of my previous post, I was away this past weekend exploring the Peruvian part of the Amazon rainforest and river. Admittedly, before this trip, I didn’t realize so much of both of those things were located in Peru. I’d always thought of the Amazon as a Brazil thing, or maybe Columbia. But apparently 13% of it is located in Peru! Whoa. Anyway, I found a 3-day tour (this one) and signed up rather at the last minute. I’m rapidly running out of weekends to go see things, so it had to be done last weekend or it wouldn’t happen. Happily everything got booked and confirmed very quickly, and before I knew it, I was on my way. I made the more-or-less smart decision to stay overnight at the Lima airport hotel before travelling, because my flight was at 5:15am (I’m doing this again this weekend – it really takes the stress out of early morning flights and prevents an early morning airport commute). One interesting experience was getting bundled into buses at the gate, then taken directly to the foot of the plane to board. I’ve done that before with smaller planes, and I think also in Frankfurt once (although I was very groggy at that time), but this was an Airbus A320 – huge up close! I fell asleep on the plane and woke up on the landing. The thing which struck me first was the humidity – it was much more humid than Lima. We disembarked down the stairs again, and just walked across the tarmac into the terminal – the airport is so small that it doesn’t really have parking areas for planes. They just turn around within the hour and leave again. 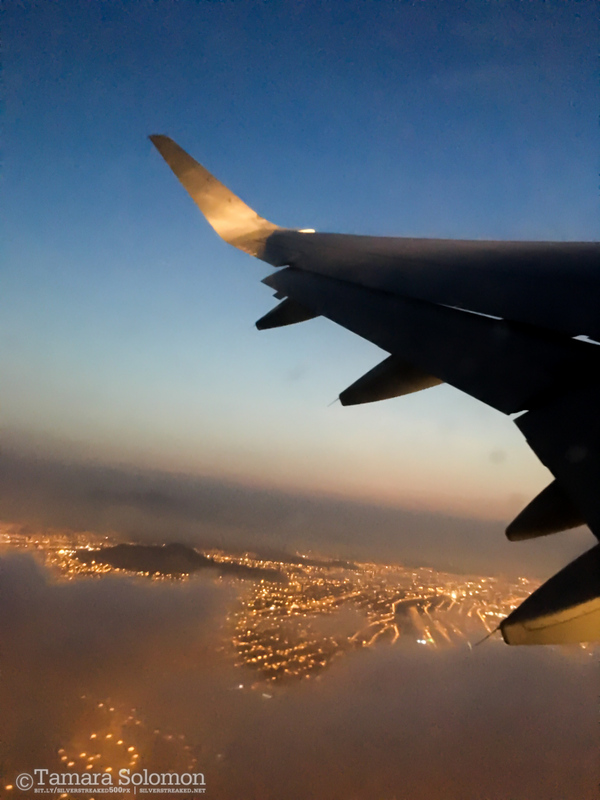 Our takeoff from Lima. The picture is blurry, and so was I.
I didn’t really know what to expect from the tour company – they hadn’t contacted me regarding how to meet them at the airport – but I was relieved to hear my name being shouted within 5 minutes of entering. We rounded up a few more people, and departed for a nearby hotel (to use the washrooms, etc.) before the transfer to our actual lodge on the river (which we’d need to use a boat for). I should mention at this point that Iquitos isn’t really a “car” city. 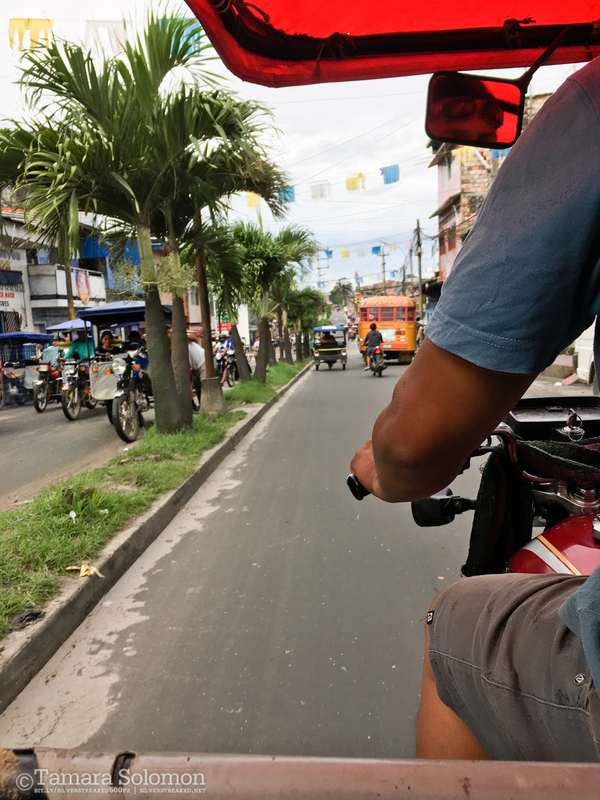 85% of people are driving motorized rickshaws (“motocars”). This is really interesting. Mind you, the traffic is still bad, but at least people aren’t generally in buses and SUVs? I think our guide said there are roughly 55,000 motocars on the road at any given time! We were early for the lodge transfer, so my driver gave us the option to take a side-trip to the local market (in the Balan district) and go by boat through the “floating houses” area, where the houses are all built on stilts and people use boats as the main form of transportation. 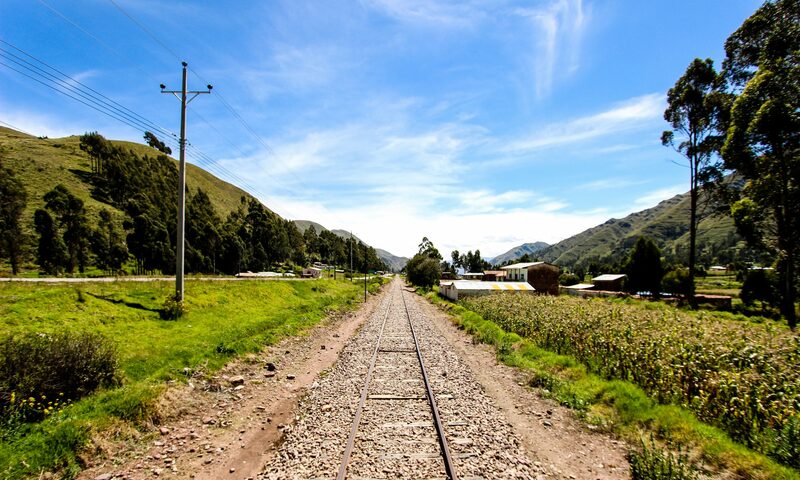 To get there, we were able to take a motocar – that was an interesting experience on its own. Mad props to our driver for the smooth journey. We visited the floating houses first. Although the boat was a little sketchy, we had a smooth journey up and down the “streets” of the area. The area floods routinely with the seasons – one of the other members of my group asked about winter, and the guide said “winter? This is winter – when it rains too much and the river gets too high”. NOTE: this is a normal way of life for the people living here, not an example of the unexpected flooding currently hitting other parts of Peru. 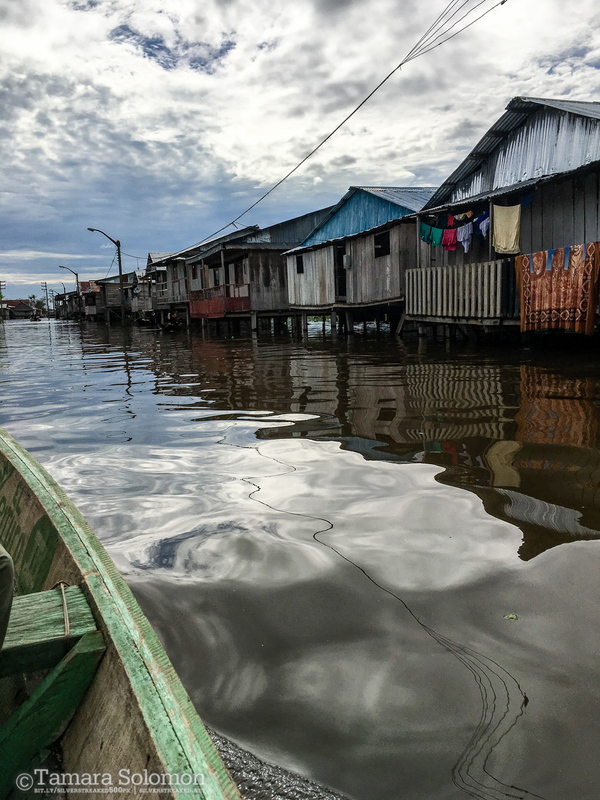 The floating houses of Iquitos. It reminded the other group member of Venice. I, having never been to Venice, can’t make the comparison, but it was definitely an interesting perspective into a very different way of life. 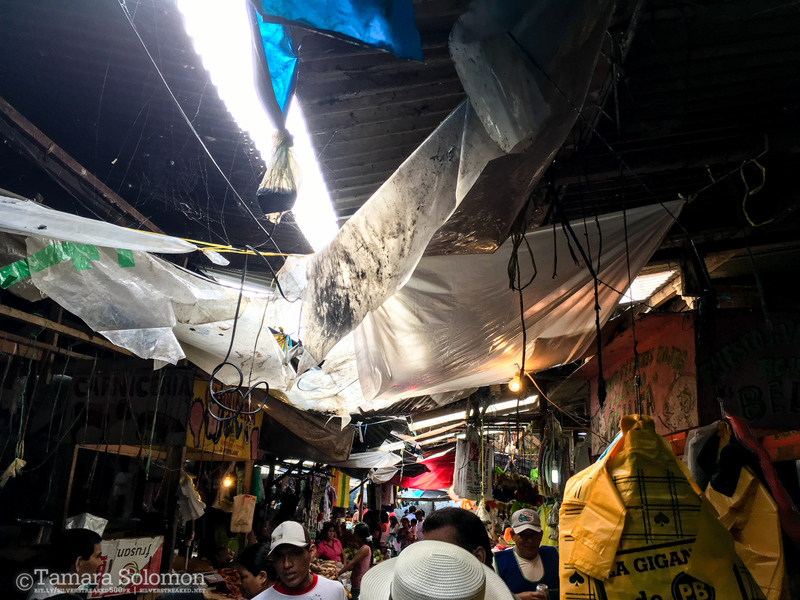 After the boat trip, we headed over to the main market. I really only have fleeting impressions of it, because the sheer scale and intensity of it was a bit overwhelming. I’d never seen anything like that market before. It was like a maze packed with people, goods, and food. Sellers displayed everything from fruit to raw chickens to fish to consumer goods like toothpaste and notebooks. There was a whole section dedicated to “pharmaceuticals”, and another one devoted to tobacco. Stray dogs were everywhere. I didn’t manage to get a good photo of the place, but I don’t think I could have done it justice anyway. Despite it being very interesting, I was a bit relieved to get out of it. It had been tough to keep up with the guide, and it was a bit claustrophobic. After a quick stop to change money (for the other member), we were finally on our way to the lodge. We transferred to the speedboat in another market area (much smaller! ), and had a 1.5hr-ish journey down the river. The guide explained some of the characteristics of the Amazon on the way… I was able to keep up with the Spanish explanation somewhat (about 40%), but enough to know that he was really abbreviating the English one! 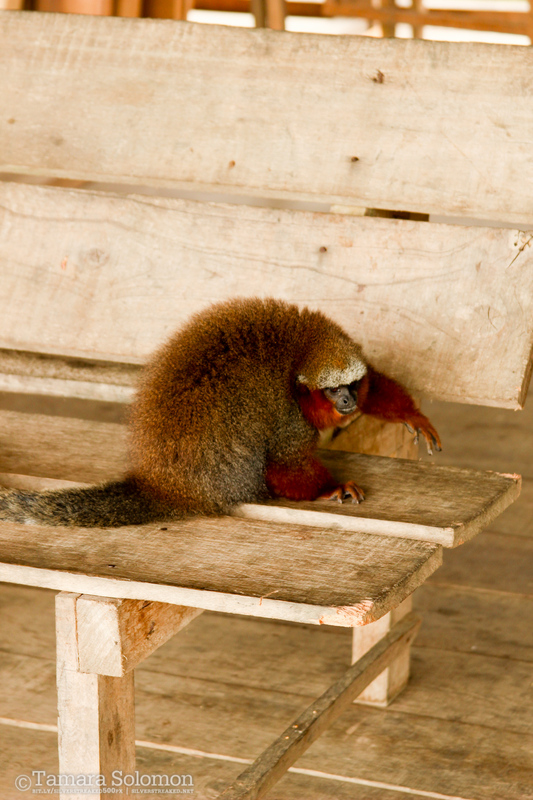 At any rate I fell asleep again somehow, and woke up at the intermediary stop – Monkey Island (Isla del Monos). This is a sanctuary for all kinds of monkeys (mostly New World), endangered and otherwise, and the monkeys just run more or less free within the boundaries. They were cute, but I also had my first run-ins with the Amazonian mosquitos here, which were very distracting. After about 20 minutes, we headed over to the Lodge. The Heliconia Lodge is a rather large place – they have 20+ rooms, a spacious lounge, a pool, a large dining hall/bar, and staff lodgings, etc. I wasn’t expecting that kind of thing in the middle of the Amazon, so it was a great first impression. They cooked all our meals for us, and we all had private rooms with washrooms (and hammocks!). It was a really nice place. The only “downside” is that they had neither wi-fi nor phone data reception (you could get phone reception in certain areas, but no data). Oh well. It was nice to unplug for a few days! 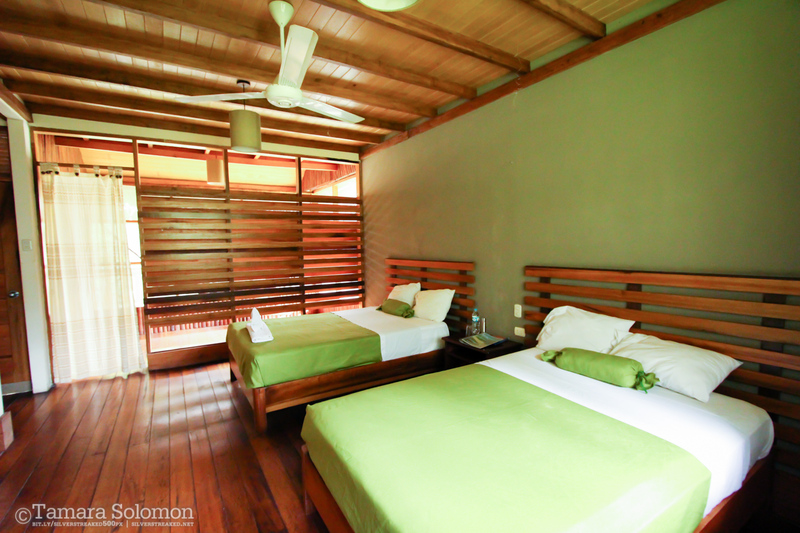 The room at the Heliconia Lodge. The curtain on the left leads to a reading room with hammock! During lunch, we were introduced to our actual group guide for the next three days, and instructed to come back in about an hour for our first excursion – pink dolphin watching and piranha fishing. Piranha fishing? I was a little skeptical of this, but it sounded interesting. We took another speedboat out onto the river while our guide explained to us about the pink dolphins, and a bit about the river. Soon we caught a glimpse of some regular grey dolphins, and then about 10 minutes later, saw an elusive pinkish fin disappear beneath the waves. We never saw the whole body, but Wikipedia assures me they are indeed pink. After some time of this, we headed into the shade (it was midday by this point), to try and catch some piranhas. I don’t have any pictures of this, but it ended up being really fun – I’d never fished before, but I nearly managed to catch one, twice. Two people in our group were successful in catching one. Apparently it’s easier when the riverbanks aren’t quite so flooded, but it was still fun. We were using old-fashioned wooden poles (except our guide, who had a modern pole). One of the more fascinating things to me about this excursion was actually the clouds. They seemed very low, low enough to make dark shadows on the water. We had most of the rest of the afternoon to relax, before assembling again at 6pm to do a night rainforest hike. We were given tall rubber boots – it was very muddy due to the high river – and we tried to cover as much exposed skin as possible. I also doused myself in bug repellent, but as I discovered, the mosquitoes simply stung through clothing and didn’t seem to care much about the repellent! Agh. I don’t have any pictures from the night hike, but one member of our group put a selfie stick to good effect to get close-up shots of the bugs and flora which our guide (armed with machete) was pointing out. It was probably the best use of a selfie stick I’ve seen, and I might be a convert to using one in the near future if I do any more rainforest trips! We saw a massive tarantula, some bullet ants, and a few other interesting species of plants and animals which I’d never seen in the wild before. It was a very educational trip for sure, but I also got bitten like crazy. Dinner was excellent, and as there were no further excursions planned until the following morning, we had the rest of the night free. I surprised both a gecko and a large… beetle (or something) in the doorway of my room on my way back from dinner, but otherwise my sleep was undisturbed by insects (as opposed to the previous weekend in Huacachina, where the bedroom and bed both had an ant problem). A bit ironic that that was the case in the middle of the jungle, but no complaints here! (I mentioned that comparison later to the guide, and he was very amused). I’m going to stop here, and follow up with the other days tomorrow – lots more to talk about, and lots more pictures to come!